Ever buy a die set but you’re not sure how to use it? Every month, Maxine comes up with three lovely designs using one die set; you won’t believe how far 1 die can go! 1. Cut a piece of the white card stock to 17cm x 11.5 cm, die cut the umbrella from this piece. Make sure to die cut your umbrella in the middle as this will become your main feature. TIP: Hold onto your umbrella die cut shape for another make! 2. Cut 10x1cm strips from the Kaleidoscope 6x6 paper and layer on the reverse of your die cut card to cover the umbrella shape. 3. Die cut the cloud and some of the raindrops from the Kaleidoscope paper collection, glue the raindrops and use foam squares for the cloud on the card front. 4. Cut a 17.5cm x 12cm piece of textured card stock, adhere to the card blank. Glue your umbrella stencil to the front of the card. 5. Stamp the ‘With Love’ sentiment at the bottom right of your card. TIP: If you aren’t confident stamping, stamp onto a separate piece of card and cut it out, then stick onto your card. 1. Cut the aperture card I half so you just have the front section then, add acetate to the back of your window aperture using double sided tape. Place a selection of 3D foam pads closely together, around the edge using the circle window as a guide. 2. Die cut a selection of rain drops using the 6x6 Kaleidoscope pad, place your rain drops on the inside of the acetate. TIP Hold onto the sheet of paper used to die cut your raindrops; this could be a handy stencil for another make! 3. Adhere another piece of acetate to secure the rain drops by connecting the two sheets of acetate with the 3D foam pads you placed on earlier. TIP: Make sure to use a lot of foam pads to stick your two acetate sheets together, to ensure that your raindrops are secure in the card. 4. Cut a 12.5cm x 15 cm piece of Kaleidoscope paper, add this to the back of your acetate shaker, colour side facing up. 5. Once complete, use a few 3D foam pads to the back of the card and adhere a blank 5x7 card to the back. 6. Die cut the umbrella from the Kaleidoscope paper pad and adhere to the front of the card using foam squares. 7. Die cut the sentiment ‘Be happy’ and glue to the front of your card to finish. 1. Die cut 10 of the 9 cm nesting dies and 10 umbrellas using the 6x6 Mulberry Kisses paper pad. TIP: For each Die cut, (umbrella, nesting, alphabet die) use a different colour/pattern to add contrast and interest to your project. 2. Mount the umbrellas to the nesting die cut shapes using 3D foam pads to add dimension. 3. Die cut the letters to spell BABY SHOWER and adhere a letter to each umbrella. 4. Punch a hole in each corner using the Fiskars hole punch and thread each square with the twine so that it runs across the front of your design. Whatever the weather, you can use these effective designs for inspiration on a range of crafty projects! These tutorials are great for Birthdays, Baby Showers or if you want to cheer someone up on a glum day. 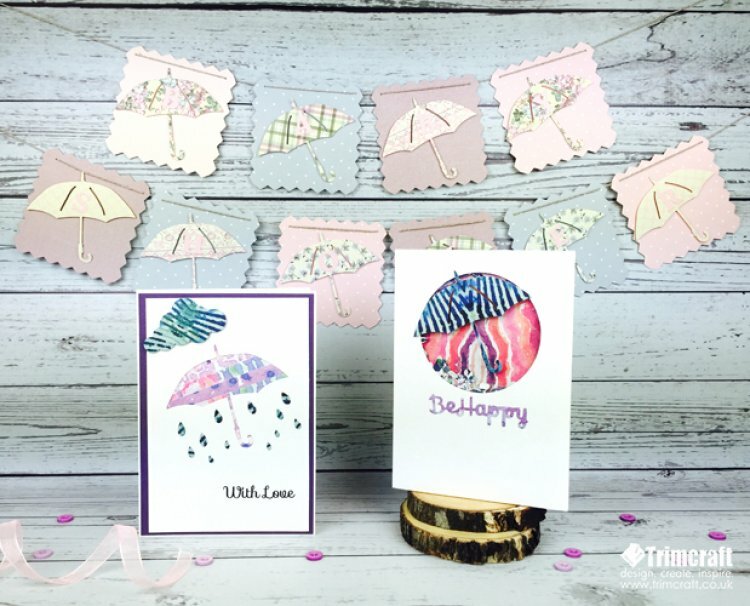 How do you use the Weather die set in your handmade crafts? Make sure to upload your wonderful makes to the Project Gallery!